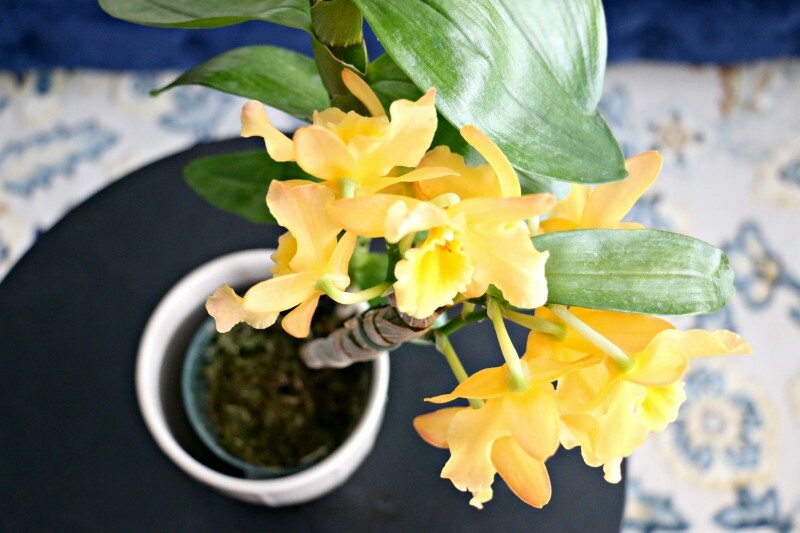 Have you ever been confused by the different types of orchids? Well I have. It is the one plant, I can’t seem to really identify properly. They are truly in a plant world of their own. I can only consider myself as one that dabbles in orchid keeping. I have shared here in the past, a few of the orchids I own. Well, the other day I found another type of orchid I had never seen. The buds on them had not yet opened and they were on sale, so I thought I would give it a try. I knew either the buds will fail to open and fall off due to the change in environment or it would be very happy and blossom. It did the latter. The flowers look a little similar to the famous Phalaenopsis. What stood out for me were the elongated pseudobulbs (thickened bulb-like stems). 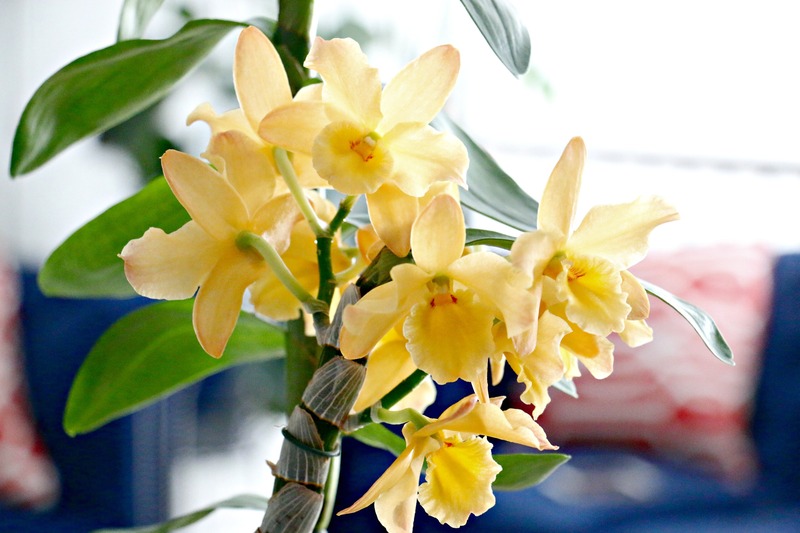 I really didn’t know what type of orchid it was but after a lot of confusion and research, I discovered it to be a Dendrobium nobile. 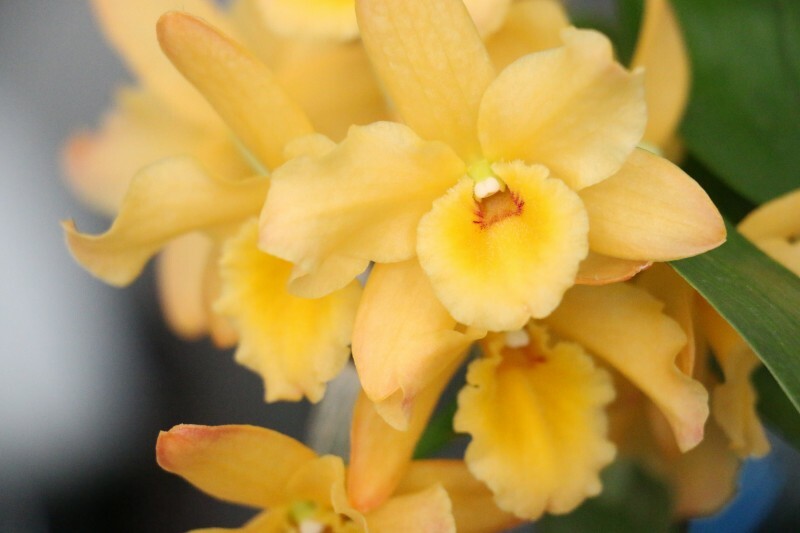 Dendrobiums are categorized into soft caned and hard canes and the care for each type is different. 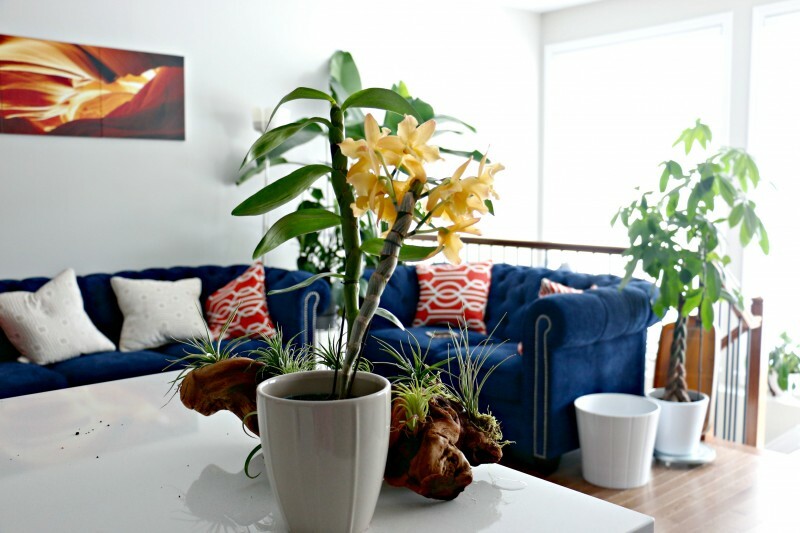 The significant difference between the two is that Soft-caned Dendrobiums like mine have blooms forming directly along the height of the canes. 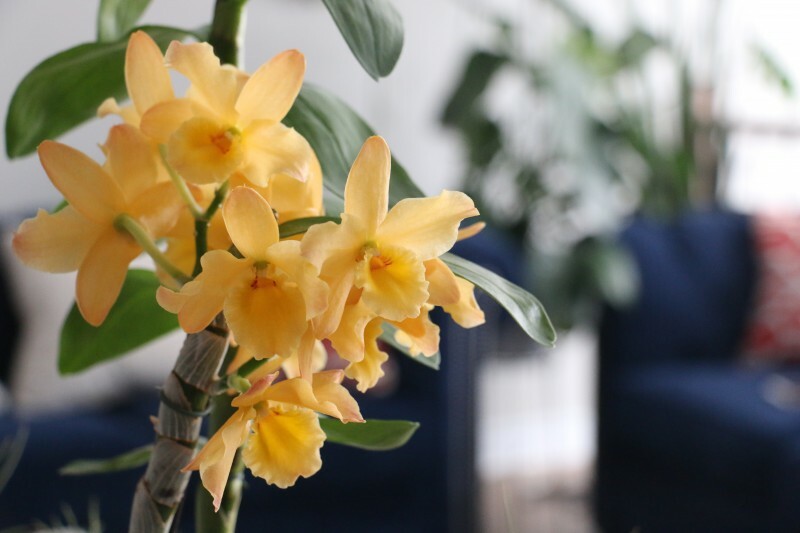 Hard-caned Dendrobriums (Dendrobium Phalaenopsis) on the other hand, develop blooms on spikes that grow at the top of the cane. They apparently keep their flowers for many years before dropping them. I will only talk about the care requirements for the soft-caned Dendrobiums. Light: They prefer high but indirect sun light. 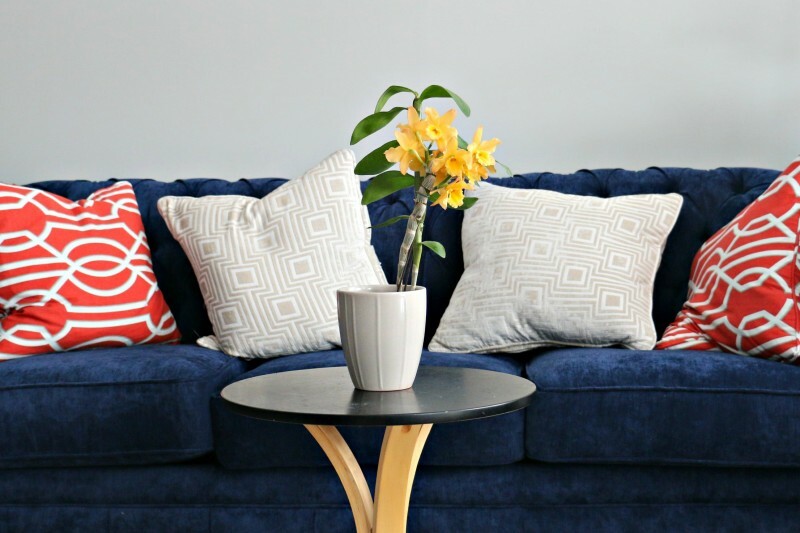 Placing it near a south-facing window away from the harsh rays of the sun will be ideal. Direct sunlight will burn the leaves. Watering: They should be watered with luke-warm water in the mornings. Once a week watering should be adequate when it is actively growing. Reduce watering in the fall to promote bud growth. In winter, water only when the bulbs look shriveled. Temperature: I rarely put temperature information for the houseplants I write about as I assume they are being kept indoors and most indoor temperatures will do for most tropical plants. However orchids are a bit picky so it is worth mentioning. Dendrobrium nobile orchids prefer cooler temperatures than most indoor plants. When they are in bloom, they do best with temperatures of 4.4°C to 10°C at night. They can tolerate temperatures between 2°C and 32°C. Humidity: Prefer high humidity of about 50-60%. Some misting may be helpful but I avoid this when I can to prevent any diseases from developing. Potting: Repot every 2nd year or so after blooming when the canes outgrow the container. Propagation:You can propagate by dividing the plant during repotting. Ensure they are about 7 canes on the main plant as dividing a plant with less than this will cause stunted growth in both plants. Any of you keep Dendrobiums? Share experiences below. If you are as confused as I am by the orchid world, don’t fret. The team over at Fresh FTD, have compiled a list of orchids for easy reference and identification. See the chart below. Oh my goodness, I never knew there were so many orchids! They are truly beautiful plants, nearly hypnotic I find. I had one that was doing brilliant until I went home to Spain for the summer and it pretty much died. I refuse to acknowledge its dead as the lower leafs are green but the steams are very very dry. Do you think it might come back? Even it it was zombi style, I wouldn’t mind. What kind of orchid is it? I’m assuming it is a phalaenopsis Usually after flowering, the flowers fall off and the spokes they grew on dry up. You should cut the dried up spikes. If the leaves are still green it means it is still alive. Very soon it will grow new spikes and flower again when the conditions are right. When you say “canes”, do you mean the divisions on the stem? Nice one that yellow one. Hi Nini, The canes is just another word for the stems.